Artwork – The Outpost at Brett Writes! I’ve been doing a few CD format covers for 19 Nocturne Boulevard. 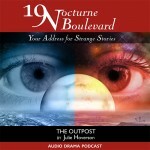 It’s an audio drama podcast anthology show of horror, fantasy and science fiction. The first cover I did was for the episode The Outpost just as a sample. I’m doing them semi-regularly now. They’re great fun to do, and the anthology format lets me stretch myself creatively in a number of genres I like. It’s also good to work to some kind of deadline, and to try not to get hung up on getting it “perfect”, just to get it “done”. I’m pleased most of all with the colour — the main theme of the play is gender, and while the male/female eyes shows it obviously, the pink and blue shading reinforces it subtly (as long as your culture subscribes to the “dress boys in blue, and girls in pink” cliché of course). Eye! by Fabio Lollobrigida. Creative Commons Licence: Attribution 2.0 Generic. Ben’s Eye by Dan Foy. Creative Commons Licence: Attribution 2.0 Generic. Mars the Red Planet by Jason Burmeister. Creative Commons Licence: Attribution 2.0 Generic. I love the commons. Thank you to you all. The starry background, logotype and design are all original.